The Downtown Highrise is a fancy establishment and a great place to live for the young urban professionals, offering good closet space and an excellent view…until such a time as the city is overrun with giant bloodthirsty monsters. A Corporate Headquarters is a large and impressive building where decisions get made and a variety of middle managers seek to one-up one another in an endless quest to get ahead, none of which will matter when the city burns. While an industrial complex isn’t pretty, would any city be without a place for the thriving masses to work endless hours trying to create goods and services for others to consume, all the while oblivious to the approach of titanic horrors? On a beautiful tropical island, players will find 5-star resorts, an active volcano, and giant monsters looking to destroy everything! 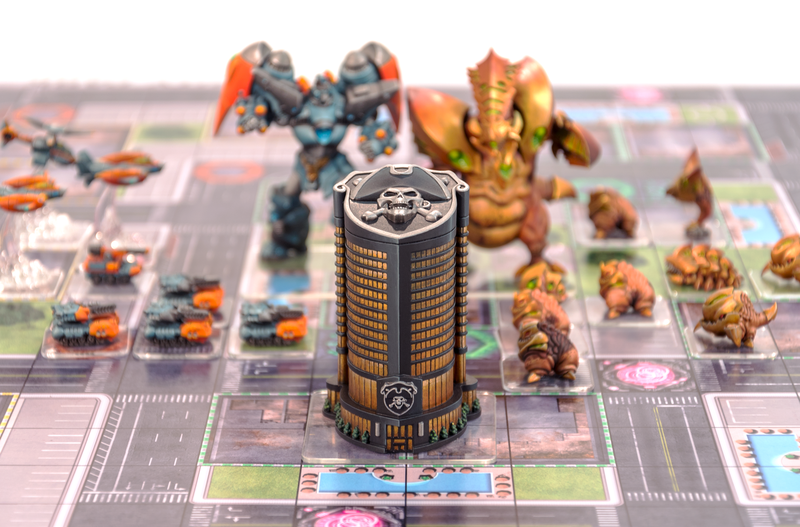 Island of Annihilation is an introductory league for Monsterpocalypse that provides a brand-new game map for players! Order any Organized Play kit through your distributor today! You can also register your store at store.privateerpress.com/customer/account/create/ and order your kits online.